A Teddy bear is a perfect companion. A loyal friend for life's ups and downs. 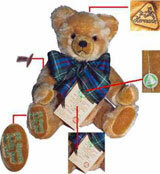 HERMANN-- Spielwaren GmbH Coburg, Germany has produced teddy bears for the world for three generations.